Amy Edmondson defines psychology safety as “a belief that one will not be punished for speaking up with ideas, questions, concerns, or mistakes.” The benefit is that this can lead to high performing teams and innovative ideas. To align with a shared belief at a team or organization level, it explicitly requires a change in the way a culture works and this will take time. More specifically, a culture shift that must occur in the following areas: openness to asking questions instead of staying quiet for fear of looking ignorant; admitting mistakes instead of hiding them for fear of looking incompetent; offering ideas instead of holding on to them for fear of looking intrusive; and challenging norms instead of sitting back for fear of sounding negative. As it can take time to shift to a culture of psychological safety, I have seen great benefits in treating this as a journey. I encourage this as my experience has shown that attaining psychological safety requires several components that work together. With that in mind, I’ve created, tested, and applied what I dub the Psychological Safety Roadmap. This roadmap is meant to be adaptive as your starting point and the dynamic as each organization is different. The journey and practices therein are meant to be spaced-out and applied over months as building psychological safety takes time. As you proceed with your journey, you may also add or adapt the components of the roadmap. 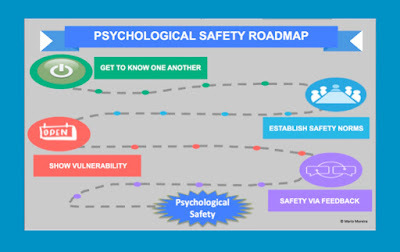 The components or metaphorically the cities along the journey to psychological safety include: Get to know one another; Establish Safety Norms; Show Vulnerability; and Practice Safety via Feedback. Within each city, there are a lot games and practices you can visit or try, each supporting the city you are in. It is important to understand that the roadmap is not meant to be sequential and instead, several cities may be visited concurrently. The only exception is you should visit the city of Getting to know one another before visiting the city of Showing Vulnerability. My experience has shown that it is easier to show vulnerability after you get to know someone. Now let’s visit each city on the roadmap. The city of Get to know one another includes practices and games where team members will, well, get to know one another. The intent is if we know about each other, conversations tend to be safer and easier. This includes practices and games such as “Who am I?”, “If I were an animal, what would I be?”, “How do we educate ourselves”, and “Checking-in”. The second city on the roadmap is Establish Safety Norms. The intent here is to make meetings a safe space to encourage speaking up with ideas, questions, and concerns. This includes practices and games such as “All voices will be heard”, “Learn to repeat”, and encourage such attributes as being curious and non-judgmental. The next city is Show Vulnerability with the intent that being open and showing vulnerability helps build trust and creates a safe space within a team. This includes practices and games such as “Circle of Vulnerability”, “I Feel Safer When”, and “Three Before Me”. The fourth city on the roadmap is Practice Safety via Feedback. The intent is giving feedback with good intent helps build trust and create strong relationships. This includes practices and games such as "Appreciative feedback", "Differentiating feedback", and "Reflection for improvement". 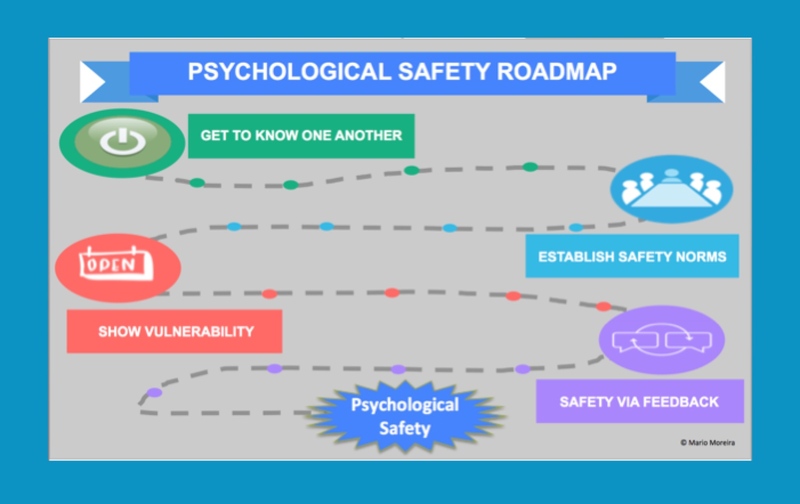 As you approach the Psychological Safety Roadmap, remind yourself that it is not meant to be a sequential journey nor are the games and practices a definitive list of what can be applied along the journey. You (or your team) are meant to visit several cities (and practices and games therein) sometimes concurrently and it will take many months to achieve psychological safety. Enjoy the journey and remember that your goal is to create a safe environment for people to speak up with ideas, questions, concerns, or mistakes. This can lead to high performing teams and innovative ideas. To learn the basics of psychological safety, consider reading: Psychological Safety leads to High-Performing Teams.